Question: "iTunes could not back up iphone because the backup could not be saved on the computer. I've looked into the support forums and it says delete existing backups as they may be corrupt or locked. I've done this and it still does not back up the phone. I just get the aforementioned error message." If you are one of the Apple fans who makes backups of your iPhone/iPad/iPod touch to computer with iTunes all the time, more often than not you may see an error message that tells you iTunes could not to back up iDevice. This is usually accompanied by a set of error messages like "iTunes could not back up the iPhone because not enough free space is available on computer", or "iTunes could not back up iPhone because the backup could not be saved on the computer". 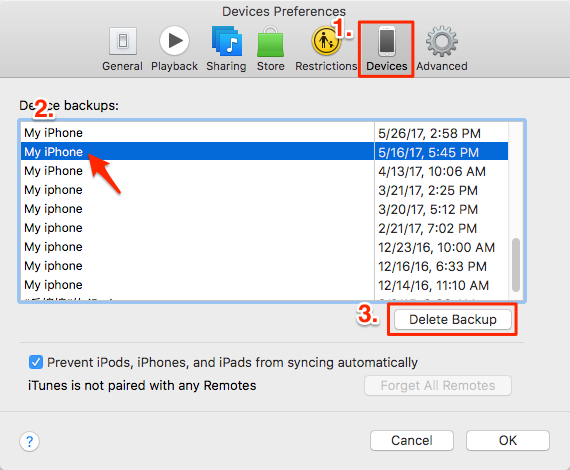 If you do happen to run into an iTunes backup failure as the above user says, try the following solutions to successfully backup the device again. After restarting, try to make the backup again. You can update within iTunes, or by downloading the latest version from Apple's iTunes download page. If iTunes never finishes the backup or stop responding, you might need to update, or temperately uninstall your security software. Learn more about how to fix the issues between iTunes and security software. You can refer to this guide to know how to reset the Lockdown folder in iTunes. If you still have trouble on backing up iDevice with iTunes or the above solutions is complicate and time-consuming for you, you can try back up your iPhone/iPad/iPod with an easier way – using AnyTrans. Firstly, check the main features of AnyTrans. AnyTrans is a full-way and all-around iOS content management utility made for iPhone, iPad, and iPod users. First of all, it supports almost all of your iOS content, including photos, music, videos, contacts, messages, notes, books, bookmarks, voice memos, voice mails, etc. Moreover, it allows you to transfer data from iDevice to computer, to iTunes, to another iDevice, and add content to iDevice from computer, so it is simple and quick to backup your iDevice to computer with AnyTrans. In addition, AnyTrans also provides you with powerful iCloud management feature which allows you to view and download data from iCloud backup to computer like messages, notes, contacts, call history, calendar, voice mails, etc. We also present you other problems you might meet when you are backing up iPhone/iPad/iPod with iTunes, you can refer to the articles below to find a quick solution.